'Boron Rods' are part of a range of Boron based preservatives and are often used inside wood together with Boron Paste, because these two products dissolve at different rates according to moisture content. These high strength solid Boron rods are used to protect timbers which are constantly or occasionally damp: external joinery, wall plates, embedded beam ends, posts etc. They can also be used in conjunction with BORON ULTRA 78 paste, to act as a long term reservoir (Standard Boron Rod Sizes - 8mm x 24mm and 8mm x 65mm). Injecting Boron Ultra 78 Paste. 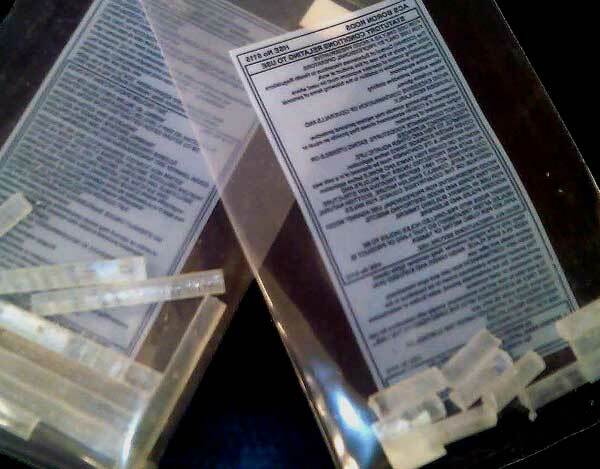 Packets of 10 Boron Rods in 8mm diameter. Example of insertion in a window frame and a joist. A unique 5% and 40% paste using a special blend of technical grade glycols as carriers. It can be injected into timber, with the advantage of supplying a highly concentrated mobile preservative which will spread even at low moisture content levels. Simple to apply with a standard skeleton gun; more effective to use because of the higher available level of active content, which allows the use of smaller (8mm, rather than 10mm) and/or fewer drill holes. 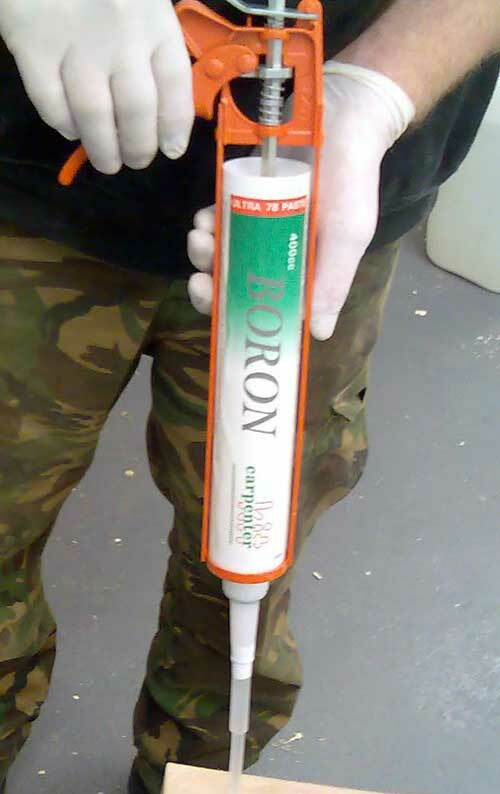 Boron Paste in a mastic tube, with an extension adapter nozzle. For injection into wood to kill rot and insects. We offer a printed Certificate of Product Guarantee for Boron Rods for individual Property addresses, should you require one for your Bank, Building Society or a house purchaser. Call us for details on 01626 331351. See our Technical Information page for Boron Product Safety Information. The Boron based Rod is fully Licensed by the HSE and is not hazardous, unless eaten. Click to go to Technical Information.